The nation's largest and most expensive destroyer headed out to sea Monday for final builder trials before being presented to the Navy for inspection. 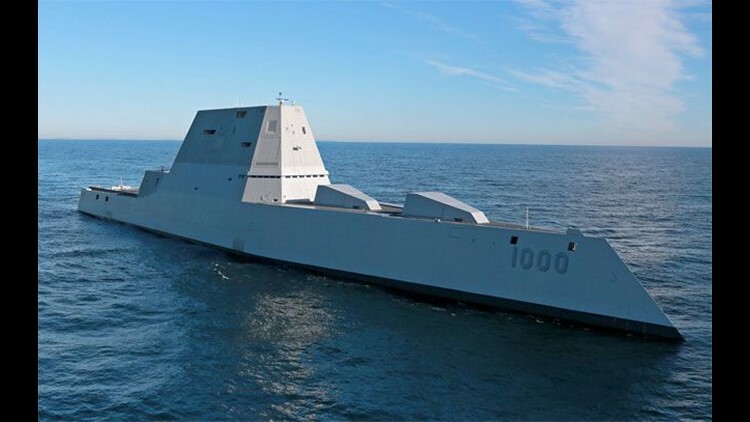 BATH, Maine (AP) — The nation's largest and most expensive destroyer headed out to sea Monday for final builder trials before being presented to the Navy for inspection. Engineers and technicians at Bath Iron Works are going to focus on propulsion, mobility and safety to ensure the future USS Zumwalt is shipshape before the next trials, in which the Navy will perform a pre-delivery inspection. Rear Adm. Peter Fanta, director of surface warfare, said he likes what he has heard from the ship's commanding officer during the first trials in December. "He was extremely impressed with the stability of the ship, particularly in hard turns, particularly in its seakeeping ability," he told The Associated Press. The 600-foot ship is unlike anything ever built for the Navy. It features an angular shape to deflect enemy radar, a wave-piercing "tumblehome" hull, composite deckhouse, electric propulsion and new guns. Automation allows it to operate with a smaller crew than existing destroyers. But those innovations come at a high cost. The Zumwalt, the first of three ships in the class, will cost at least $4.4 billion. The price ballooned to the point some in the Navy tried to kill the program. Instead, the program originally envisioned for 32 ships was truncated. The ship, which will be based in San Diego, stands to play a role in the Obama administration's "rebalance" of resources to Asia and the Pacific, where China is flexing its military muscle in the South China Sea. But Fanta said he'll want a full assessment of capabilities before determining exactly how the ship will be used. More than 200 Bath Iron Works employees and Navy personnel are participating in the builder trials to prepare the ship for delivery to the Navy. The ship is due to be commissioned into service in October. After the Navy takes delivery, there will be even more assessments, including rough-weather tests to determine the performance of the unusual hull that gives the ship a pyramid shape. "We go to find the most miserable places in the ocean and drive at various sea stages," Fanta said. The Navy believes it knows how the ship will perform, but it won't know for sure until all tests are completed, he said. The departure of the warship in the midst of a snowstorm on Monday marks the second time the ship has gone to sea. The "alpha" trials in December, which gave engineers their first opportunity to test systems at sea, were deemed a success even though repairs were needed on one of the ship's 12 motor drives.